The hydrangea is a deciduous shrub characterized by its blossoms and green foliage. The most common hydrangea is the bigleaf hydrangea, which is native to Japan. There are three common fungi that attack the hydrangea leaves: powdery mildew, cercospora leaf spot and anthraconose. Powdery mildew disease is found largely in commercial greenhouses, attacking a number of hydrangea cultivars; they are then unable to sell these diseased plants. When powdery mildew attacks hydrangeas in the landscape, the symptoms are a powdery/white coating on the underside of the leaves, with the topside of the leaf turning purplish-brown (the topside of the leaf can also remain green). You may also see the powdery mildew on buds and new growth. You will need to use a wettable garden sulfur fungicide, following the manufacturer’s application directions. Generally, the fungicide is applied as soon as you see the powdery white coating. You must also make sure to dispose of all of the leaves/dead plant material in the fall so that the diseased material does not overwinter beneath the plant. It is also a good practice to mulch the plant. Mulch helps to keep the spores of the fungus from being splashed back up on leaves. Some research has been done on the use of anti-transpirant sprays and their ability to help plants that can be subject to mildew resist infection. In theory, the spray coats the leaves and makes it harder for the mildew spores to adhere to the leaves when it rains. Cercospora leaf spot is characterized by small, scattered brown or purple spots on the leaves that are located close to the base of the plant. Spotting generally begins in midsummer and becomes prominent in early fall. This disease causes the leaves to fall off of the plant prematurely, and it will affect the number of flowers, as well as the overall appearance and vigor of the plant. The disease is spread by spores from the fallen leaves. These spores remain on the ground and are easily spread to healthy leaves by splashing water/rain. Remove the diseased leaves and apply a fungicide that is recommended for cercospora leaf spot (following the manufacturer’s application directions). Look for products that contain the one of the following active ingredients: azoxystrobin, chlorothalonil, mancozeb, myclobutanil, and thiophanate-methyl. These ingredients are used in curative systemic fungicide products. The fungicide should be applied as soon as you notice the disease. You may need to do several applications of the fungicide. Anthracnose attacks the leaves and also the flowers. 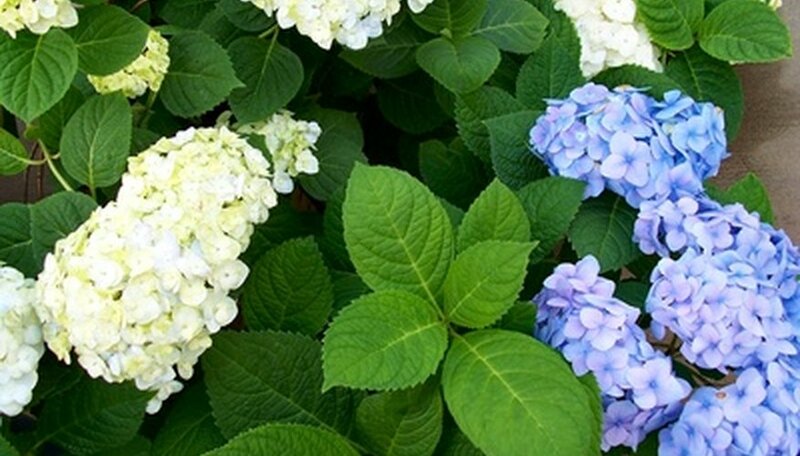 The fungus thrives in hot, wet weather and on hydrangeas that are heavily fertilized. Anthracnose is characterized by round, slightly irregular brown spots on the leaves and flowers. The spots appear stamped or sunken. Spots can be as large as an inch in diameter and look like a bull’s-eye. They will appear on the base of the plant as well as the top of the plant, on both leaves and flowers. Treatment is the same as with cecospora; diseased leaves will need to be removed and a fungicide should be applied. You can use chlorothalonil or thiophanate-methyl (following the manufacturer’s application directions).